There was a pond near a village. Near the pond there lived a group of wild ducks. A turtle had also built his house there. The turtle had good friendship with the wild ducks. The turtle became astonished to see the flying wild ducks. Often the turtle said to the wild ducks that you enjoyed flying in air. I also want to fly here and there like you. But the wild ducks made him realize that he was made to creep so he could not fly. As the time passed the turtle's wish to fly was getting stronger. Now he often said to them to teach him to fly. The wild ducks had become fed up with the turtle's desire. When the wild ducks saw that the turtle was not ready to leave his desire they decided to solve that problem. Then wild ducks hit upon an idea to fulfill the turtle's desire. One of the wild ducks said to the turtle. Look! You do not have the feathers so you cannot fly but we have an idea to fulfill your desire. Two of the wild ducks from us will hold the stick in our beaks and you just hold that tick with your mouth from the middle. In this way when we will fly holding the stick. You will be able to enjoy flying. The turtle was very talkative. 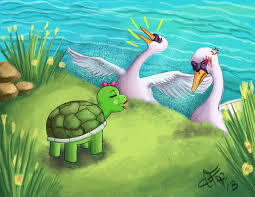 The wild duck said to the turtle, listen do not dare to open your mouth in air because if you do so you will die. The turtle promised the wild ducks that he would definitely act upon their directions. The wild ducks held the stick in their mouth and flew upwards by taking the turtle in air. The turtle was getting excited by strolling in the air. The wild ducks took a round over the village. The people of village got astonished by seeing the turtle flying along with the wild ducks. The turtle became very happy to see people's attention towards him. He thought to tell people that he could not only creep on earth but he could fly in air also. As the turtle opened his mouth to tell that to people the stick separated from his mouth and he fell down from the height. The turtle died immediately as he fell on the earth.